Vibration Monitoring "Of all the parameters that can be measured non-intrusively in industry today, the one containing the most information on machine condition is the vibration signature"
Machinery failure is expensive and disruptive, you don’t want to be in the dark about machine condition. A vibration monitoring program will bring the light you need. Deterioration in a machine’s condition is quickly recognisable and the frequency spectra can detect the specific type of machine fault such as unbalance, misalignment or bearing damage. The vibration data, downloaded to a PC, forms an invaluable database on which to base maintenance decisions. 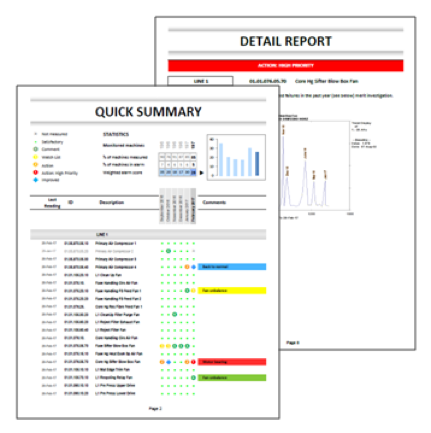 We use the fastest and most advanced analysers / data collectors available and provide clear reports with recommendations for action. If you prefer to start your own vibration monitoring program we can guide you and train you. Or it may be most suitable for you to install an online system – we know the best and most cost effective systems and can offer a complete package. Predictive Maintenance can take readings on a scheduled basis and issue a report highlighting any issues with recommendations for action. 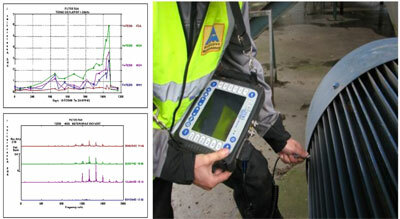 An in-house vibration monitoring programme can be set up. Predictive Maintenance can advise on suitable equipment, create the vibration database in the software and train personnel in analysis of the vibration data. It may be justified to fit continuous monitoring on critical machinery. Predictive Maintenance can advise on suitable equipment (see also our Sales page) and install. In addition technologies can be added such as thermography and the flux coil can be added to complement the vibration monitoring programme. The flux coil is used to detect issues such as broken rotor bars and stator faults.